Tibet is located at the southwest boundary of China. It is the main body of the Qinghai-Tibet Plateau, the highest and the youngest plateau in the world. Owing to complicated geology, Neo-tectonic movements, geomorphology, climate and plateau environment, various mountain hazards, such as debris flow, flash flood, landslide, collapse, snow avalanche and snow drifts, are widely distributed along the Jinsha River (the upper reaches of the Yangtze River), the Nu River and the Lancang River in the east, and the Yarlungzangbo River, the Pumqu River and the Poiqu River in the south and southeast of Tibet. The distribution area of mountain hazards in Tibet is about 589,000 km2, 49.3% of its total territory. In comparison to other mountain regions in China, mountain hazards in Tibet break out unexpectedly with tremendously large scale and endanger the traffic lines, cities and towns, farmland, grassland, mountain environment, and make more dangers to the neighboring countries, such as Nepal, India, Myanmar and Bhutan. 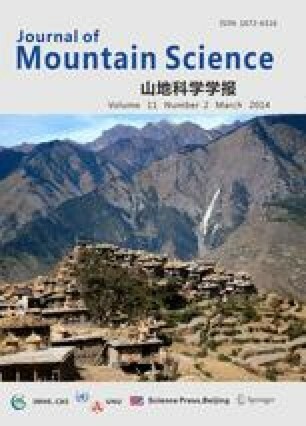 To mitigate mountain hazards, some suggestions are proposed in this paper, such as strengthening scientific research, enhancing joint studies, hazards mitigation planning, hazards warning and forecasting, controlling the most disastrous hazards and forbidding unreasonable human exploring activities in mountain areas.